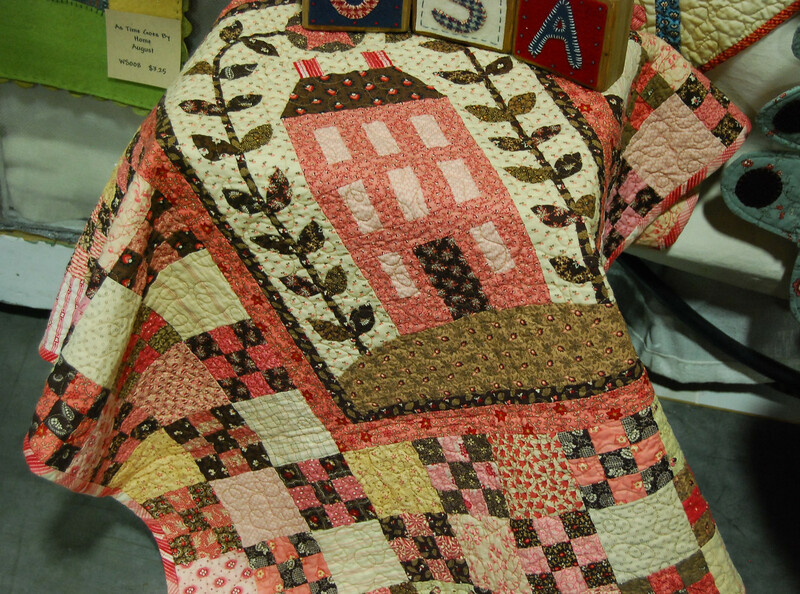 Textile House: A bit more on my trip to Market..
A bit more on my trip to Market.. Yesterday I mentioned that I had met Tara Lynn Darr of Sew Unique Creations. Her book is such a treat, here is a sneak peak of the projects you'll find in it. My sister, the new Vanna! Kathy Schmitz - What a charming lady. She was just so down to earth and fun to chat with. She has some ornaments coming out for those embroidery buffs. 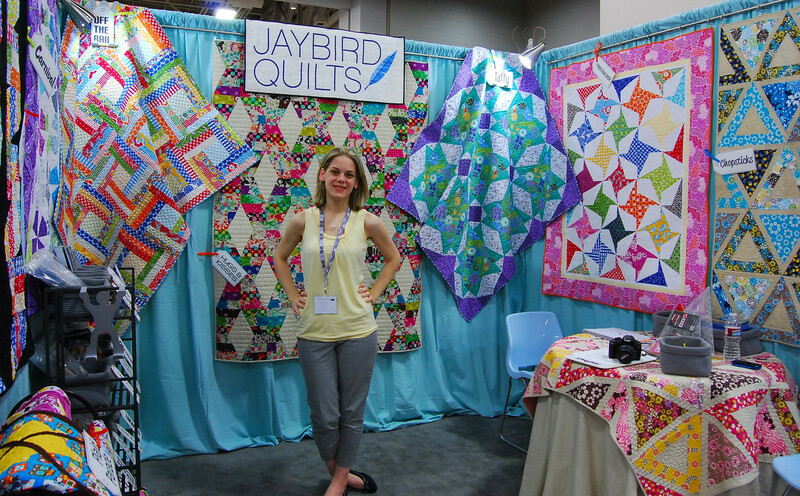 Got to express a bit of admiration to Julie Herman from JayBird Quilts. I have followed her blog since forever and have really loved seeing her go from blogger to designer. Then there was Sweetwater. Their new line Hometown was the hottest ticket around. Loved Sunkissed (still cannot find any pattern worthy of cutting into it) and Hometown is just as delicious. And then there was Tula Pink's Prince Charming. 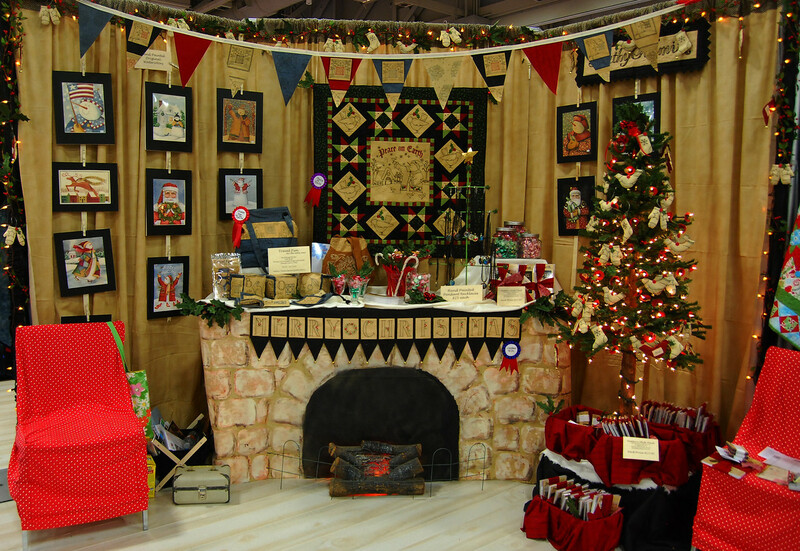 They won 2nd place on best booth. No wonder on that account, it was wall to wall Princes! Her new line reminds me of Neptune which I never got to touch. I will need some of this one so I don't find myself kicking myself later. 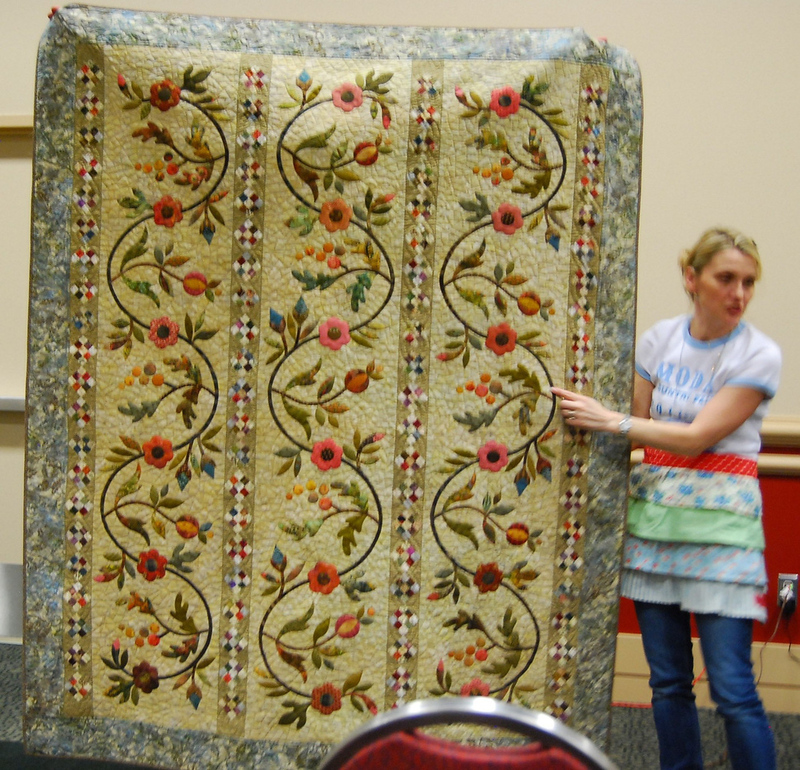 Besides the quilts in the books I chatted about yesterday, here are a few quilts that have made it to my must make before I croak list. 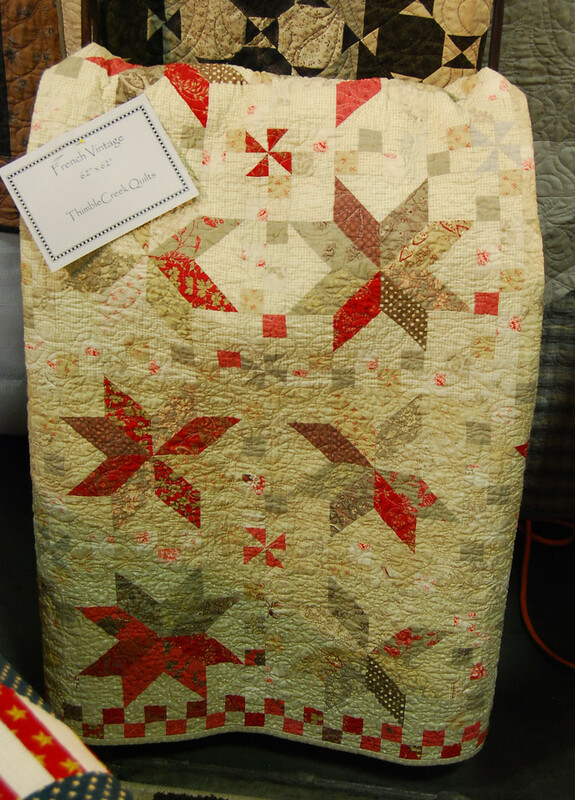 French vintage by Thimble Creek Quilts was made with French General fabric. 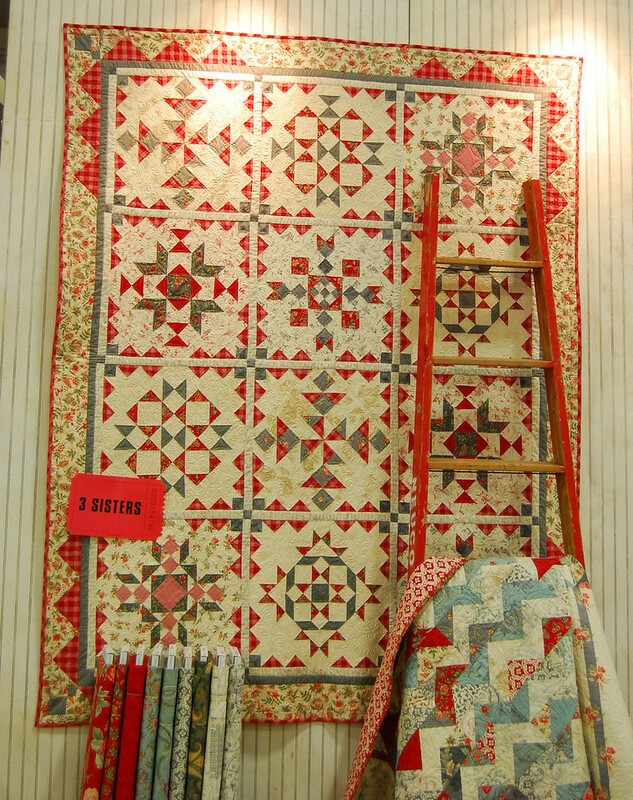 Is it just me or does French General have a monopoly on making all quilts look fantastic? Someone should look into that because I didn't buy their Petite Ecole line and I'm worried I might see a quilt I need to make using that line. I also hesitated on their new line and by the time I got back to the table at Sample Spree they were all gone. I felt a bit sick. The good thing is that it hasn't hit the stores yet, so there is still hope. This one is a BOM from This and That made with Etchings by Three Sisters. I kept going back to the This and That booth to look at the pattern and I picked up a flyer at Sample Spree but I could not nail down why I liked it so much. It was your typical pieced BOM pattern. That was until I saw that the fabric used was Three Sisters. I am a bit of a three sister's addict. This one is a mystery. I don't know the designer but I saw it last year and was loving it. Since I had just started piecing Opening Day I was not too insistent on this one but this year I pouted a bit and my sister (Vanna again in this picture) ordered the pattern and will be carrying it. I am soo excited! I can't wait for it to come in! This little one comes in the same pattern! It's a Two-fer! 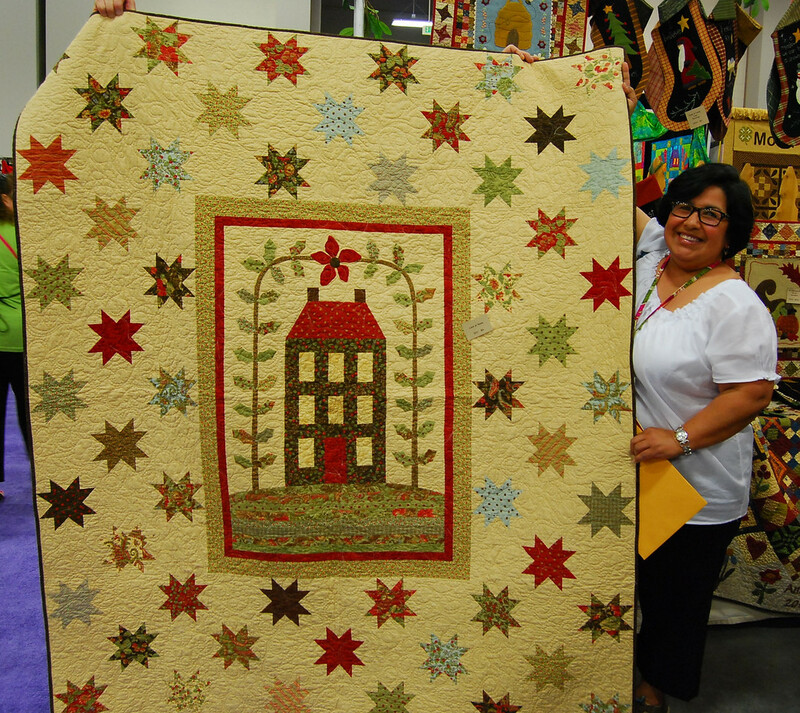 Can you believe that she made that using a fusible applique method? She makes you feel you can tackle anything. I really didn't buy much (Wedding bells on the horizon makes you a bit more careful with the budget) but I did break down and picked up a Fat Eighth of Ruby by Camille and Bonnie. I don't know if I am totally in love with it yet, but I picked it up in case I have a fit later because I need it. Of course, I already mentioned my obsession with Three Sisters. I love these Fat eighths that are being sold. It gives you more than a layer cake but not as much as a FQ. Just the perfect amount to get you going. My daughter had strict instructions for me going into Sample Spree. Either a sample of Tula Pink's Prince Charming or Sweetwater's Hometown. 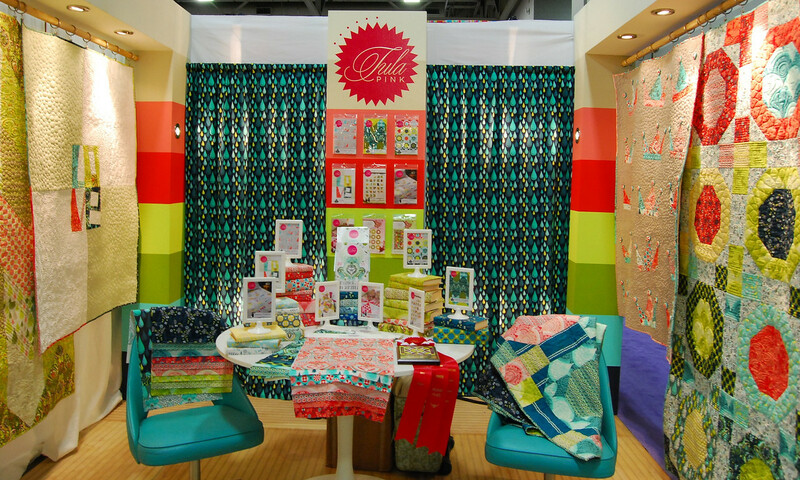 Free Spirit was not at Sample Spree so that killed the Tula Pink idea so I headed straight to Moda's table (like the other gazillion other quilters). 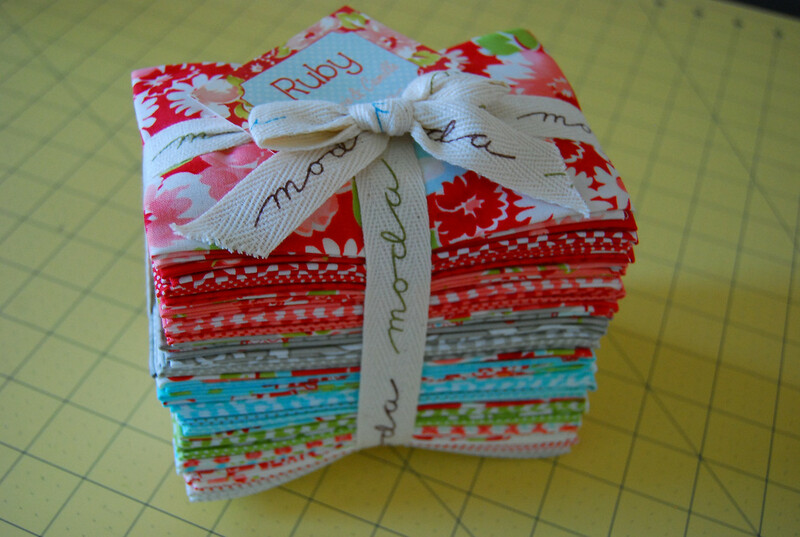 I was looking for just one FQ bundle of Hometown. There was NONE to be found. I crawled around the whole table, getting elbowed, pushed and shoved. While peeking under people and touching things that should have not been touched by strangers. Just when I was about to give up and was in front of the checkout person, out from my peripheral vision I caught the sight of a cardboard cover moving enough to get a glimpse of what was underneath. It was TWO bundles of Hometown. I developed some internal propulsion engines and soared over two ladies (I did apologize after) to put my hand over one of those bundles. My heart was racing, my face was flaming but I was able to hold my head high when I called my baby the next day and told her "I got your Hometown - It was no problem!" LOL! The things we do for our kids! My trip was great! 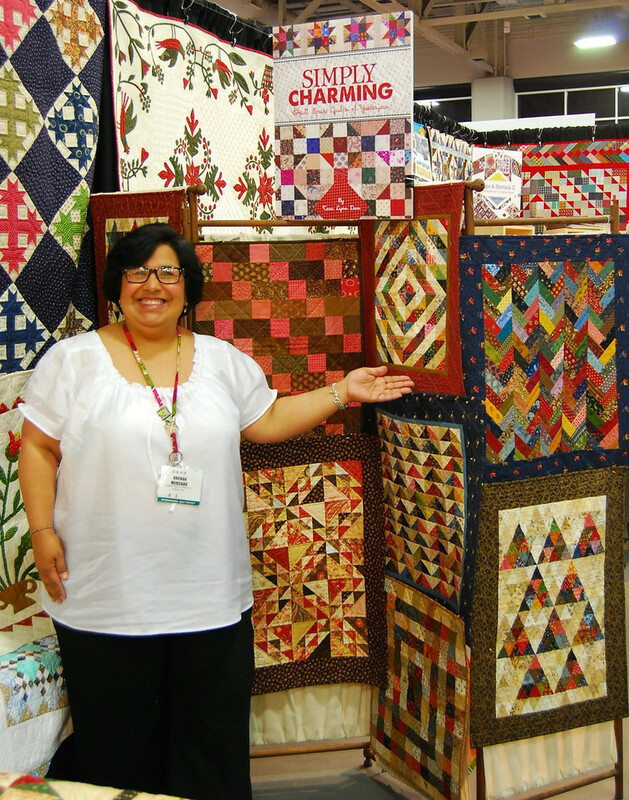 Met some outstanding quilters and made some new friends. One of my favorite meet ups happened before the craziness of market actually kicked off. On Thursday, as I touched down at the convention center, Thelma from Cupcakes 'n Daisies was heading out. I was so lucky to meet up with her for a few minutes, something that I never thought would happen with her being on the other side of the country. It was like seeing an old friend even though we had never actually "met". We have chatted so much off line and through our blogs that it felt like we already shared that first meeting before. On the downside... We were so wrapped up in chatting we forgot to take a darn picture!! LOL! Oh well, We now have a reason to meet up again. Hopefully soon! 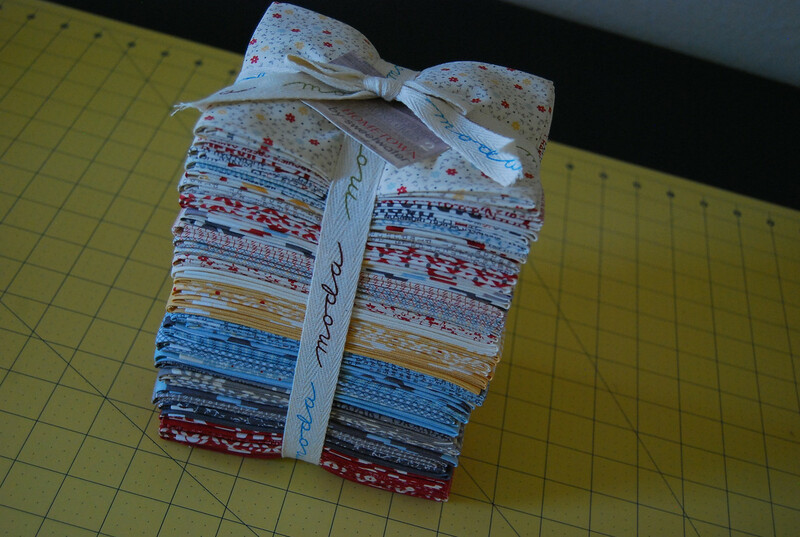 5 comments on "A bit more on my trip to Market.."
I love that French General Quilt too! SO....make two will ya?!!! I really enjoyed reading your post and thoughts on the market. What a great time you had. Thanks for showing us what is coming in the months ahead. I like many of the same things you do. Your story about getting that Hometown bundle for your daughter was hilarious! 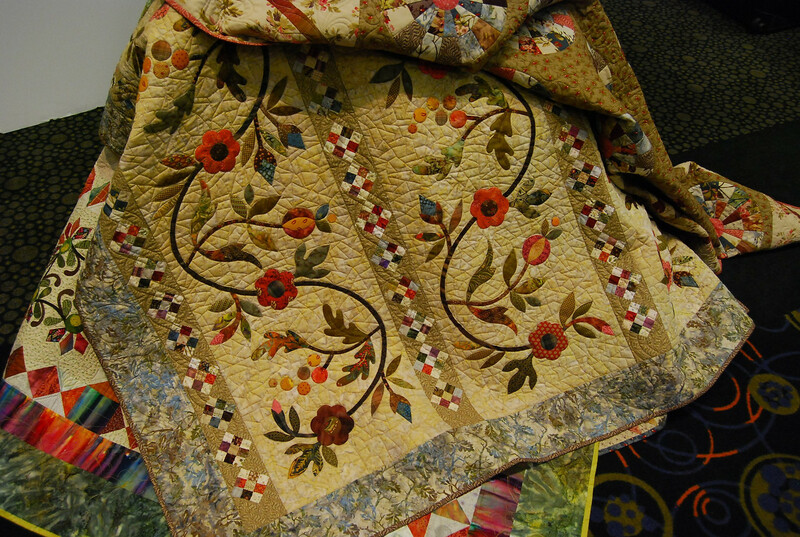 You're so lucky to have a daughter that quilts. My daughter is only interested in finished quilts, she'll take all of mine that I'll give her, which is something I guess! What a wonderful trip you had, I missed Edyta Sitar's booth, and she was on my list to checkout, she must have gotten set up after I left. I just love her designs, now that I applique! Did you see her next line of fabric, it's supposed to be half cottons half batiks! I agree, we'll meet again for sure and get that picture! 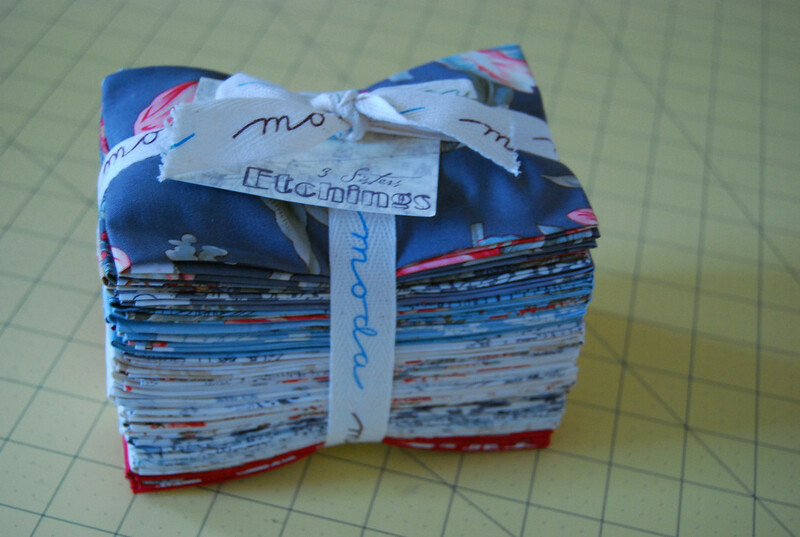 OOhh, Edyta's quilt is just fab...might have to make that myself! 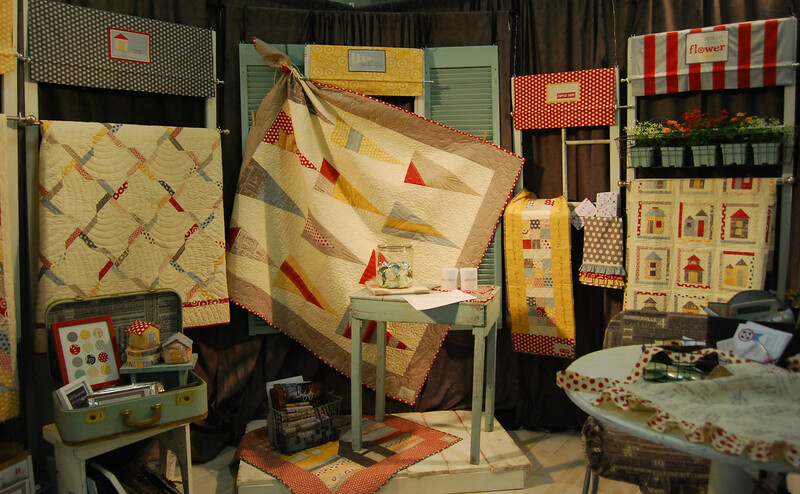 So glad you and the lovely Vanna had a great time at Quilt Market. I enjoy hearing from both of you. That Pumpkin Patch is quite a temptation!